Schwartz, who holds art and design degrees from UCSB and the Art Center College of Design in Pasadena, also admits that he is not the first person you’d expect to operate a thriving company. “I’m an artist and designer. The last thing I wanted to do is run a business.” As an early adapter of graphic web technology, however, he found a niche in the market. And, despite the odds, his ad agency, IdeaWork, with 14 employees and small satellite offices in Las Vegas and Manhattan, boasts an impressive client list. One might not know that IdeaWork is a mighty mite of the advertising world when looking at that list, which includes Hard Rock Hotels, MGM resorts, Public Hotel, and Caesar’s. The three awards — in the Web sites and online marketing categories — were for campaigns the company ran for N.Y.-based gym chain Crunch Fitness. Although IdeaWork might be limited in resources, Schwartz explains that his firm offers some distinct advantages over big agencies. His group does all their work in-house whereas large agencies often subcontract. This gives them creative control over an entire campaign. It also means that Schwartz can work personally with all of his clients. IdeaWork is a full-service “interactive agency,” according to Schwartz. The agency does everything from smart phone apps, brand development, and Web development to e-commerce platforms and click-search marketing. Examples include the company’s three award-winning Web sites: crunch21.com, holidaysweater.com, and thecrunchbunny.com. 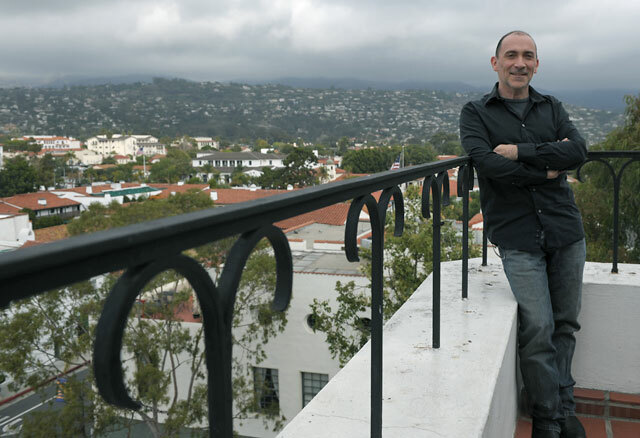 Schwartz said that most of his college cohort fled Santa Barbara after they graduated, convinced that the city is bereft of professional opportunities. He adamantly denies that Santa Barbara is a terrible place to do business. “People make up their minds that there are no jobs in Santa Barbara,” says Schwartz. “I completely disagree with that mentality. There’s a ton of opportunity. There’s a ton of little businesses.” Schwartz further argues that the quality of life in S.B. far outweighs higher wages available in metropolises. One of the Santa Barbara traditions he has personally helped bolster is the I Madonnari Italian street-painting festival held every year at the Mission — the oldest such event in the country. He has contributed a painting every year since 1992 when, as a senior at UCSB, he responded to a flyer on campus seeking someone to fill in for an artist that had dropped out. Schwartz’s paintings are reproductions of masterpieces, typically from the 1930s and 1940s and in the WPA or Mexican mural style. Among his favorite artists to reproduce are Diego Rivera and Thomas Hart Benton. The allure of street painting, says Schwartz, is that it combines fine art with performance art. “When you see a painting in a museum, it’s out of context. This is an opportunity for people to see artists while they’re creating the painting … this is about process,” he said. Schwartz paints at festivals all over the world; he has traveled to Mexico and Italy several times, his furthest trip being to Santa Barbara’s sister city, Toba City, Japan. Claiming that he “had no frickin’ idea” what he was getting himself into when he did his first chalk drawing, Schwartz explains that his street painting is the yin to the yang of his professional work. Both are creative, he says, but at the end of the day, IdeaWork is there to please the client whereas his finished paintings look exactly the way he wants them to.